At the Scotch of St. James Club in London in September 1966, Jimi met Kathy Etchingham and almost immediately they were a pair. Kathy doesn’t remember meeting Nancy. I found Kathy, emailed her and asked. She remembers Chas Chandler’s apartment at 43 Upper Berkeley St. And she suggested to me that maybe Nancy “visited Upper Berkeley Street while Jimi and I were out,” before Chas threw them all out of his apartment completely, in 1967. Kathy (played by Hayley Atwell in the controversial film, Jimi: All is By My Side) told me she took all the decorations from Jimi’s room in Chas’ apartment and used them in their new apartment at 23 Brook St., which is apparently now an “English Heritage” site. Nancy also remembered hanging out in Chas’ apartment. It must have been, as Kathy says, when she and Jimi were out somewhere. But Chas was there as Nancy recalls, there with his girlfriend Lotte, and Mike Jeffery too. 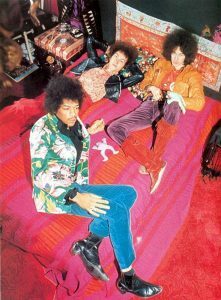 Jeffery was there as the business manager of the newly formed (1966) Jimi Hendrix Experience, while Chas Chandler was acting as production manager. 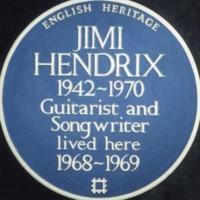 Jimi had a room in Chaz and Lotte’s apartment in London. The apartment itself was very suburban and neutral. Except for Jimi’s room. It was decorated like an E. Indian prince’s chamber. All the walls plus the ceiling were covered with printed fabrics and tapestries, tent-like, with bells and mirrors hanging on the walls. It was an artwork. One night, Chaz, Lotte, Mike and I were in the living room and Lotte brought out a Ouiji Board. This wasn’t anything more to me than a ‘game board.’ It wasn’t my idea of truth or anything. I got the sense that Lotte was just using it as an excuse to say something to me, which she did. I was smiling inside cause she didn’t understand. And I was worried Mike wouldn’t understand either. My unconditional love for Jimi lasts until this day. But it was not covetous. I didn’t want him for my own, for myself. I just wanted him to be happy and treated fairly, and to be able to express himself freely and be appreciated. I loved him deeply, understood him and if I could have helped him in anyway, I would have. But we were peers. I couldn’t have children, but I imagined that I had close to that feeling for him, at least in part. But, Lotte, Chaz and Mike were not prepared or able, nor did they need to know what I felt. That night, when we were alone, Mike and I made love, as always. But I was worried that he might be convinced, by Lotte, that my thoughts weren’t with him. There was no one else but Mike in my mind. Never was. Hasn’t been since. I still dream about Mike, and he still has the capacity to leave me in my dreams. And it still feels the same. ← Previous Previous post: Groupie Soundscape. A studio wired.